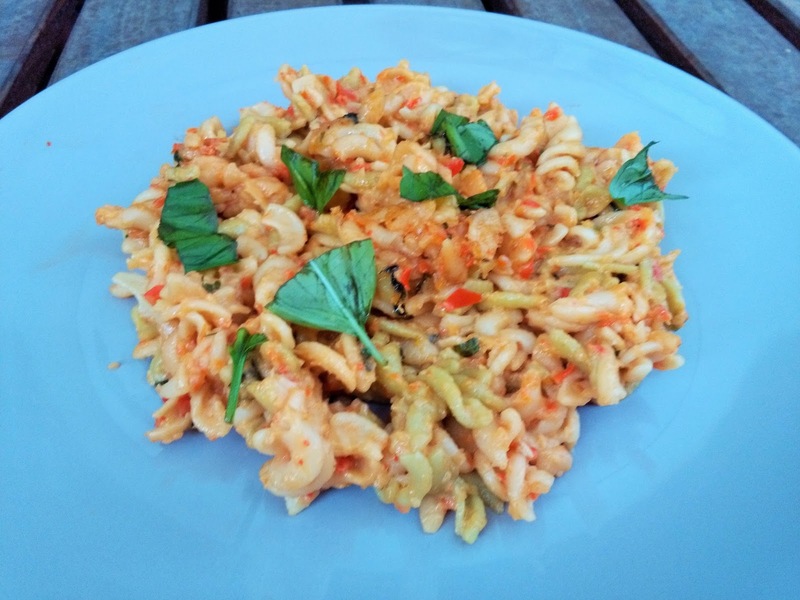 Being a fanatic of pesto, the red pepper in this recipe caught my attention. I have never thought about including that so I thought I'd give it a go. It was heavenly, brimming with flavor, thanks to the red pepper and basil. One will notice that it's certainly not the same as an ordinary pesto. You will probably have the ingredients to hand so this recipe is super easy and can be prepared and cooked very quickly in 6 simple steps. 1. Bring a large pot of salted water to a boil. Cook the pasta according to the package directions. 2. Meanwhile, add the oil and butter to a large pan over medium-high heat and melt the butter. Add the garlic and chopped onion and saute until starting to soften, 2 to 3 minutes. Add the chopped red peppers and cook until hot, 2 to 3 minutes. 3. Carefully transfer the contents to a food processor or blender. Put on the lid and puree the pepper mixture until totally blended (there will still be some texture to the peppers). 4. Pour the red pepper puree back into the pan. Add the stock, 1/2 teaspoon salt and some pepper, and stir until heated. 5. Add the cream and stir to combine. Add the parsley and basil and stir to combine. Taste and adjust the seasoning if needed. 6. Drain the pasta and add it to the pan. Add the Parmesan, and then stir it together to coat the pasta. Serve with extra Parmesan and a sprinkling of parsley and basil on top.